All products list are legally compliance under Thai FDA and with a worldwide accreditation, DSC Syndicate and the partners manufacture the production following GMP, HACCP and HALAL Standard to accomplish the high standard production, hygiene facilities and high quality products. The high quality skincare and cosmetic products produced in compliance with the up-to-date GMP standard. Provamed emphasizes and divides products into 6 categories following market demands and customers’ need. 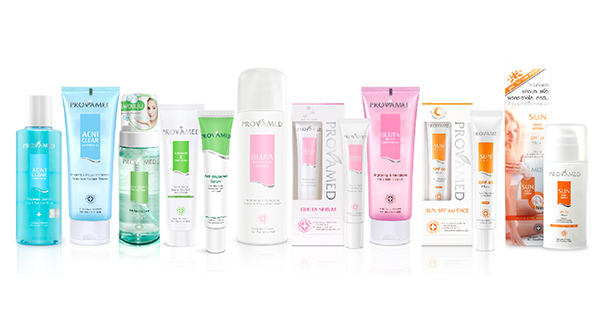 With the success and overwhelming responses from product users, Provamed has been proclaimed as cosmeceutical products according the properties of giving satisfaction results, safety for sensitive skin with dermatological tested. Gluta Series – Anyone can have a Miracle Aura Skin. Whitening Series – Disclose your exquisite skin. Acniclear Series (Acne Treatment) – The proper treatment for acne. Sun Protection Series – Non-Chemical sun protection for your skin. Scar Treatment Series – A perfect scars fading and stretch mark healing. Babini Series – With Soothing Triple Natural Essences & Allium Cepa, suitable for everyday adults and babies’ usage.